Are there more people living in your house? Have you had house guests? Have you topped off your pool or filled a kiddie pool? Have you had a holiday gathering or been cooking/baking gifts? Did you have a party (cooking, cleaning, etc.)? Have you been watering plants? Have you left an outside faucet on (or the hose on)? Are there any swampy, muddy or wet areas in your yard? The Village of Williamsville does not routinely estimate water usage. We use a computerized system and drive by to read water meters. A small number of meters are read on foot. Meters are read around the 20th of the month and may vary a few days from month to month, depending on when the weekends fall. Some months may have an extra weekend or holidays and may affect your water bill if you do laundry/cleaning/yard work on weekends. If you suspect that you have a leak, please contact our office at 566-3806 and we will ask you the questions listed above. If the answer is yes to any of them, we have an answer but sometimes someone may need to come out to check your water meter. If the meter is turning when no one is using water in the house, it indicates that there is a leak. We do not check for leaks inside your house. If a leak is suspected, you will need to contact a plumber to repair it as soon as possible. How much water am I losing from that dripping faucet? Regular shower heads average 6 gallons per minute, or 30 gallons for a 5 minute shower. A low-flow showerhead can reduce your shower water usage by half or more. If your house was built before 1994 and still has the original plumbing fixtures, you're using 30-40% more water than a comparable new home. You have to run water through a garbage disposal while you're using it. An open faucet uses 3.5 gallons a minute, and if you run the disposal 3 times a day for one minute, that's 10.5 gallons! A low-flow toilet uses 1.6 gallons per flush, while a regular toilet uses 5 gallons. If you flush the toilet just 6 times a day, you could save 20.4 gallons of water every day. If you have a lawn, chances are your biggest water usage is during growing season. 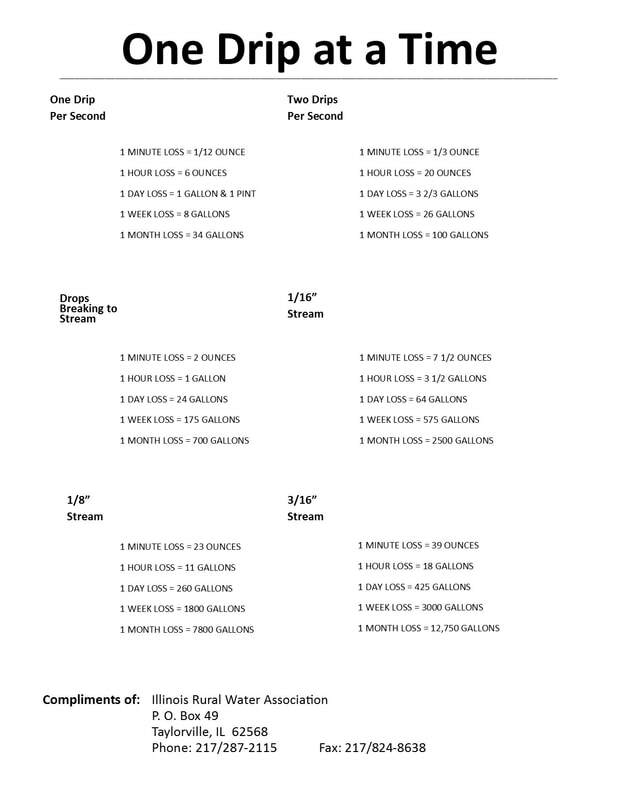 Running a sprinkler for 2 hours uses 600 gallons of water. If you water twice a week, that's 4,800 gallons a month or an average of 160 gallons per day. Top loading washing machines use 30-40 gallons per large load. Front loaders use 20-25 gallons per large load. Using the "small load" setting custs water use in half.